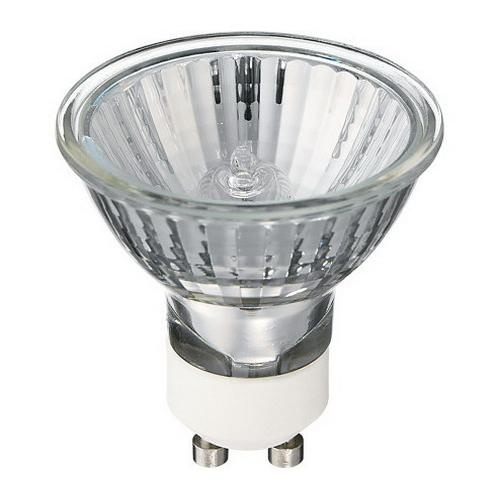 Philips Lighting Twistline 50-Watt MR16 GU10 base halogen lamp offers 430 initial Lumens for crisp light output. It has voltage rating of 120-Volts. This lamp in clear color, has color rendering index of 100. Lamp with 2800K color temperature rating radiates white light to the surrounding. This dimmable lamp delivers average life of 2000 hours. It measures 53 mm x 51 mm Dia. The twist and lock base effectively enables easy installation as well as secure fit. It emits or distributes light at beam angle of 25-degree. Halogen lamp is perfect for track and recessed lighting applications.